I had a very nice, long holiday break, and I hope all of you had the same. Rather than spending a lot of time sewing, I did lots of other things instead. One of them was to start teaching my husband how to draw. 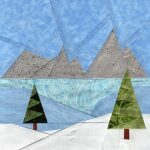 Of course I sat a little with the sewing machine during the holidays and started on this quilted wintry wall hanging. 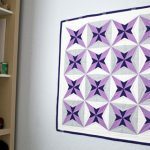 If you want to make one for yourself, the Colonial House quilt pattern is already available on my Etsy shop. I am hand quilting mine. I was hoping to show the finished quilted mini today, but I am a pretty slow hand quilter. So more to come soon on this little wall hanging. In the meantime, I thought I’d show you a few beauties that I have acquired over the last few months. My friend Kris at KrisLovesFabrics sent me this very generous cut of fabric along with the cute pincushion. I am going to make a travel bag with the fabric. The pretty yellow pincushion sits on my shelf where I can see it as soon as I walk into my workroom every morning. I love yellow, it makes me happy!! I really liked a fall quilt Kelly at My Quilt Infatuations made, so I left a comment on her blog post. I was both happy and surprised when I found out I had won this gorgeous giveaway from Benartex. Each piece is a half-yard cut. The set will make a lovely fall quilt. Last year my little kitty-cat got sick and I made this quilt for him. I entered it in the Pantone Quilt Challenge 2014 to share the story. Little I knew that I would actually win and get a gift certificate from the Fat Quarter Shop! I wanted to use the gift certificate to buy fabrics to make something special, so I held on to it until very recently. 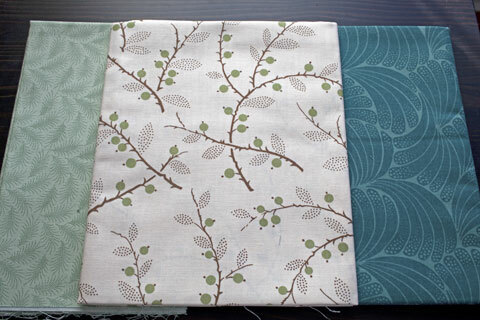 I finally have an idea for a quilt and these Downton Abbey fat quarters are just the fabrics for that project. I also got these Downton Abbey fabrics for the same quilt. Last year was a mix of good and bad for us, but these beautiful gifts definitely tipped the year toward a glass-half-full year. A little late, but A Very Happy New Year to all of you!! Your house is just so lovely. Oh my… I just clicked through to your patterns. You have so many great patterns. I just love the castles! And I’ve been thinking about greys and purples lately, so I love that fabric pull! That is an adorable house! Can’t wait to see how you quilted it! I love your cottage block. It reminds me the house we raised our kids in. It was a red brick Geogian Colonial. Heading over to Craftsy to put it on wish list. Cute pincushion. Oh your wins are wonderful Soma! I love the text print (and your lovely pincushion). I’m so glad that you ended up having a ‘glass half full’ year. I’m looking forward to seeing your Downton Abbey fabric project. Oh my, aren’t you a lucky gal being gifted with all those pretties! I must say your Winter Cottage block is amazing! 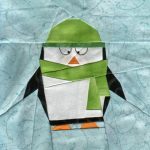 Your paper piecing patterns never cease to amaze me, Soma! I was missing you a lot!!! Happy New Year dear friend!!! Your work is stunning, as usual!!! I love that winter cottage. Great colors! Your pincushion is wonderful too. What a sweet gift that makes. I’d say you made a great choice with the Downton fabrics. Those are so pretty. Are you following the show too? 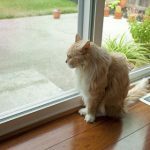 Hiya Soma, good to see a post from you :) Have missed you! Love seeing your pantone challenge quilt again, such a deserved win for such a graphic quilt! My fave pic of it is the one with Charlie on it though, is that really wrong?…ha! Love your winter cottage block, that dormer window at the top makes you want to peek inside. I finished your leaf hanging yesterday afternoon, I just stewed and stewed before the right fabric finally started calling out to me from the middle of a bundle. I believe, from this post, I might have selected the right color, lol!! Nice winnings!! I know you will turn it all into something beautiful. Clever pin cushion too, with the definition of applique, and an applique! Congratulations on your wins. House blocks don’t usually impress me, but your winter house block does :-) I have added that and the Morning Star patterns to my wish list. 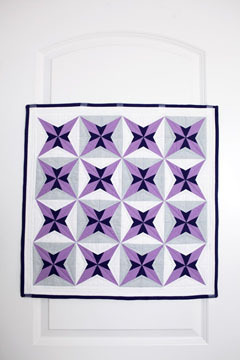 I like how the star block can make so many different combinations and secondary patterns. 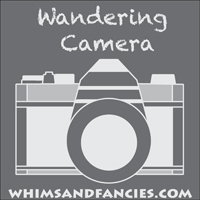 So much prettiness in one post, Soma! I love your Winter Cottage block… I thought it was a photograph at first… it is just breathing with life! I like the pattern very much. 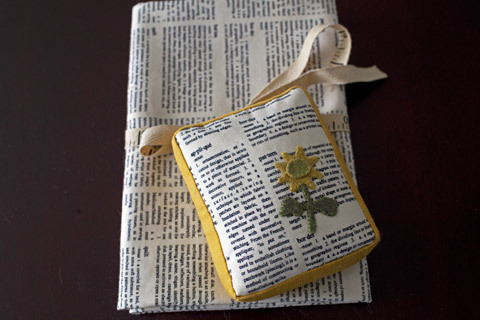 And how lucky are you- for getting the happy and sunny pincushion and fabric from Kris! 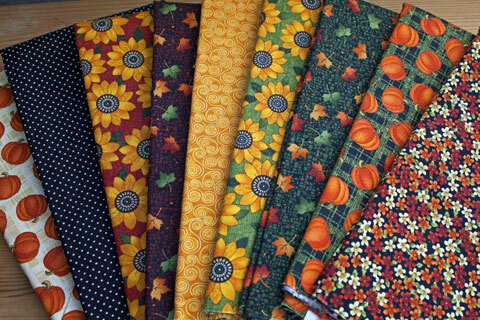 -and the fall fabrics bundle! 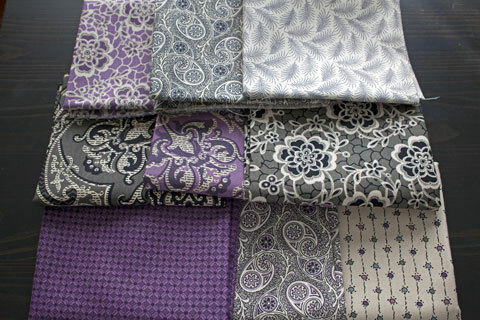 – and the Downton Abbey fabrics from FQS….You truly deserved the win for the Pantone Challenge! I can’t wait to see what you design and make in the coming year! 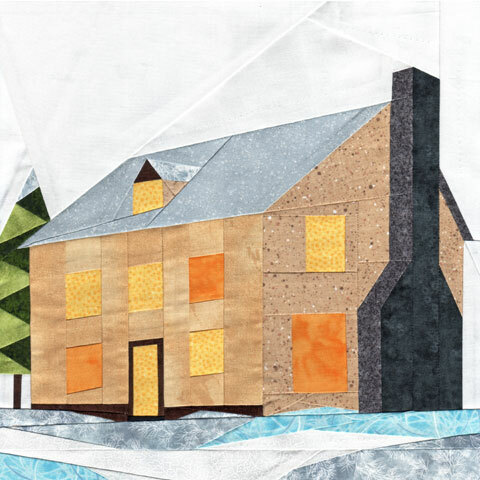 Your paper piecing patterns always amaze me, I love the house design.